Upon meeting at the earlier time of 11.15 it was clear that the Old Wesley 3rds were looking to get their season back on track. 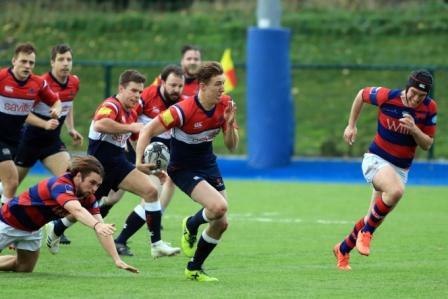 Even the bedlam of a busy Energia Park on a Saturday morning and being relegated to the far and unfamiliar end of their home ground to tog out did not throw the Wesley men off. Wesley, receiving the kick-off, got off to the start teams can only dream about, Sean dotting down within the first minute. 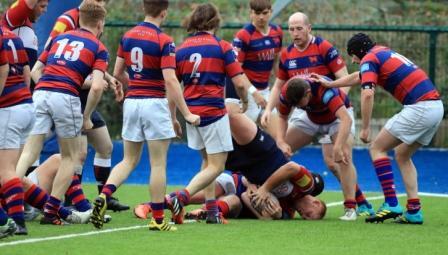 From a difficult angle the extra points were not added; Old Wesley 5 – Clontarf 0. 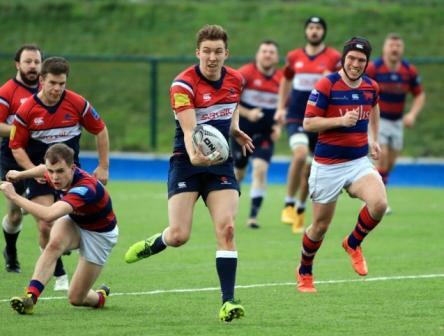 Once the game kicked off again, it was evident that the pack had something to prove when it came to scrum time as they put the heavier Clontarf pack under serious pressure; some can only compare the contest to David and Goliath. With the Wesley team stringing a number of phases together and with a crisp but untested 9 – 10 partnership the ball was spun wide where the mammoth of a man, Priesty, got his hands on the ball. Determined not to be stopped he crossed the whitewash for Wesley’s second try. The extra points were added from the boot. 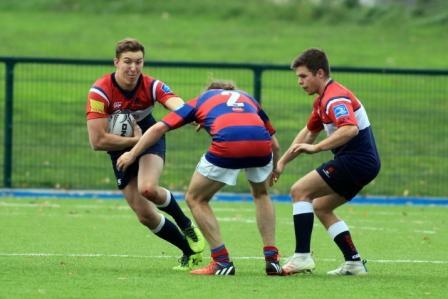 Old Wesley 12 – Clontarf 0. Clontarf worked their way into the Wesley half due to ill discipline and after multiple attacks on the Wesley line. Even the heroic defence led by the skipper Dand could not stop the North side men as a blip in concentration allowed ‘Tarf to put their first points of the day on the board. Extra points converted Wesley 12- Clontarf 7. Continuous ill discipline allowed ‘Tarf back into the game as they were awarded a penalty in which the goal kicker punished Wesley and made no mistake converting the 3 points. Wesley led into the break 12-10. The game was beginning to turn into a classic from the old rivals. In all the mayhem the head coach Hastings and support from his back room staff were able to keep calm heads and deliver the clear instructions for the second half. The Wesley line-out was functioning like a well oiled machine as the line-out master Eric plucked both offensive and defensive balls from the sky. Early on in the second half a key member of the Wesley back row was struck down with a horrific facial injury. After retreating to the side line in fear that his dashing looks may be jeopardised, the cool head of the seasoned Kinners took him under his wing and speaking from experience whispered into his ear “chicks dig scars”. Off he goes; Jack was back on the pitch. As Wesley camped on the ‘Tarf line, the dominant scrum, not weakened by the exhausted replacement Moore after his busy trip to the states (5 rides in 10 days, trooper), drove on forcing the Clontarf men to weaken and allow Wesley to cross for their third try. Some say they saw a tear drop down the face of forwards Coach Marc Warberton, proud of his men. Again Wesley applied pressure and were awarded a penalty 5 metres out. The decision was put to the skipper. Any lesser man would have taken the 3 points but not Jeff Dand who wanted another crack at the ‘Tarf pack. Multiple collapsed scrums and some silky back play led to the first yellow of the day for ‘Tarf. 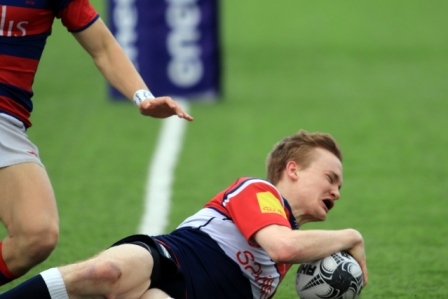 The pressure then led to the Wesley forth try. ‘Tarf tried to settle themselves by kicking long. Lucky for Wesley the delayed flights from London managed get in prior to kick off, carrying on board the ball carrying centre Luke Correll. He gathered the ball and the ‘Tarf men could only stand in awe of his freshly tanned skin. He broke the line and linked up with the always reliable Boydy who dotted down. When the game got under way again, Wesley continued to keep the pressure on. After multiple attempts at the line, the referee with an on field decision of Try had to go to the TMO! The decision was overruled and called as held up. The record breaking crowd at the packed back pitch did not agree. 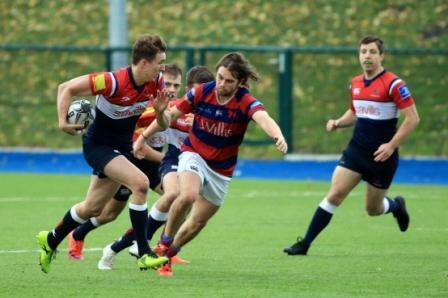 As the game drew to a close the Clontarf team accepted defeat and with the thoughts of crossing the Liffey back to their home patch they kicked the ball out ending the exciting encounter. Wesley were victorious 35-10. Upon returning to the home changing rooms of Bective Rangers even the sights of a female physio for the 5ths team could not dampen the excitement of team manager, Monty, who praised the 20 players who donned the Wesley jersey that day, and he promised to buy every squad member 3 pints and a bottle of blue WKD in the next blue light session. This victory sets up Wesley up for a mouth watering 1 versus 2 play off next week against rivals St Mary’s. Some say it may top the historic Ireland versus NZ clash in the November internationals.